My husband and I are like magnets — when we allow our opposite sides to draw together, the connection is instant and strong . When we turn away from each other, our polarity repels the other with the same force as the attraction had been. I want to get my marriage right. I want us to be happy when we see each other. I almost died, I don't have time to live a half life anymore. Being married is hard. Being married through cancer is brutal. Cancer puts "for better or worse" to the test. Recovering from cancer raises a new bunch of issues. We were in survival/trauma mode for so long, we almost didn't know what to do with ourselves when I survived and thrived. Sure, we're ecstatic that I'm well, but there are deep wounds. We all have post-traumatic stress syndrome. None us of know what to do in this new reality but pretend we're fine because to admit anything else seems like we’re ungrateful for the amazing second chance we got. 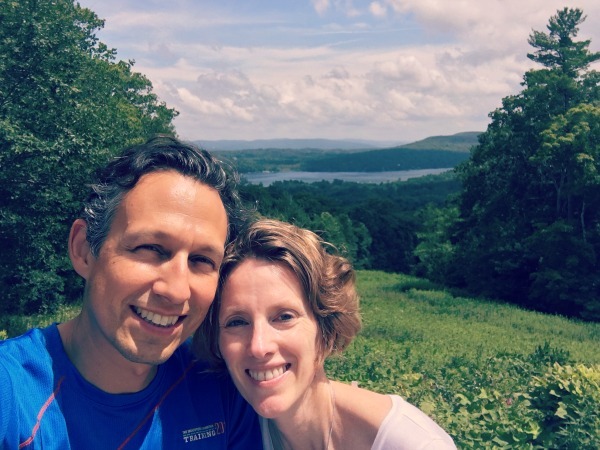 This weekend I dragged my husband to a "Getting the Love You Want" couples workshop at a Massachusetts retreat center. I had heard great things about this workshop and the type of therapy. It's called "Imago" based on the latin word for image. It was created and is still taught by the husband and wife team, Harville Hendrix and Helen LaKelly Hunt. Their relationship was just as messed up as everybody else's but they found a divine calling to find out why, try to fix it and try to help others do the same. The weekend gave me hope that we can respark our magnetic connection and live it consistently. I want to share that hope because I have too many conversation with friends (men and women) who are not getting the love they want. Most of us hate conflict and run from it at all costs. But we are two separate human beings. You have your reality and your partner has theirs. Conflict happens when your partner has a different reality than you do and you refuse to accept that difference. When you're able to embrace the space between two different people, then you can grow together. That space will make itself clear in the conflict that arises. Imago believes that we all are just reliving the wounds we had as children. We picked partners unconsciously that help us heal those childhood wounds. When our partners are unable to fix these wounds, we just keep reliving them. Okay, bear with me if it sounds like woo-woo horsesh*t. Here’s how the theory plays out in my life, when my husband comes home spewing negative energy, I immediately retreat emotionally and am actually scared at a core level. I realized it's because I feared my Granddad's dark, drunk energy that he brought into every room when I was a kid, too young to understand there was an unconscious fear of him. Imago teaches that every frustration is a disguised request. I've been trying to eliminate negativity for two years now. Imago taught me some dialogue techniques. In lieu of actual training, try to catch yourself when you say something negative, shoot that nasty eyeball or make a not-so-silent grumble. We can't stop the first thought, but we can control the second. If you mess up and go negative: stop talking, apologize and try to re-do the sentence. Paul and I committed to a 30-day zero negativity challenge and for three days it's been wonderful. Marriage is work and everyone I know needs help. Give yourself permission today to admit that you're unhappy with parts of your marriage, and then check out one of these resources to see if it can help you. Even if you've been to other therapists, this a different type of connection with your partner to live together in full aliveness. Life is too short to not love waking up, looking over at your partner (because hopefully you're still in the same bed) and thinking "I can't believe I married someone so amazing."